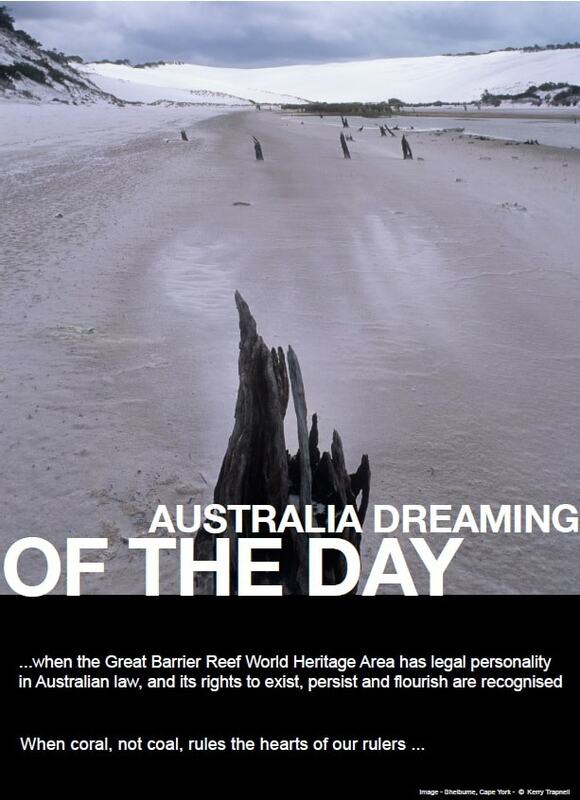 As concern for the health of the Great Barrier Reef grows both nationally and internationally, the Environmental Defenders Office of Northern Queensland (EDO NQ) has launched a campaign to bestow legal personality on the Great Barrier Reef World Heritage Area. What does legal personality mean? The most common example of an entity other than a natural person having legal personality is that of a corporation. Corporations are allowed to enforce their legal rights in court, in their own name, through representatives acting on their behalf. In granting legal personality to the Great Barrier Reef, Australia would give the Reef a certain set of rights and the ability to uphold these rights in court through representatives acting on its behalf. The concept of rights for the environment rests on the idea that a property based approach to the environment has failed. Western property law regards the environment as a resource for us to exploit as we please. Any value placed on the environment is measured in terms of the value that we can derive from its use. Giving the environment rights is about recognising that natural resources are not endless and that we are part of (and dependent upon) our environment. What rights should we give to the Great Barrier Reef? EDO NQ is not proposing to determine what rights should be given to the Great Barrier Reef – this is a matter for the community, to be decided after extensive consultation. We would simply like to start the discussion about rights for the Great Barrier Reef, and in doing so, it is helpful to consider what rights have been granted to natural systems elsewhere. Australia has not yet granted legal personality to any natural systems. However, in New Zealand a Bill is currently before Parliament to bestow legal personality on Te Urewera National Park. The New Zealand Government has also signed an agreement with the Whanganui Iwi (‘iwi’ is the Maori word for ‘tribe’) stating that when the settlement agreement is finalised the Whanganui River will be given legal personality. The notion of giving the environment rights is developing in various ways across the world. In 2007-2008 Ecuador rewrote its Constitution to include the rights of nature to ‘exist, persist, maintain itself and regenerate’, as well as to be restored where it is damaged. In 2010 Bolivia passed a law recognising the rights of Mother Earth. Meanwhile in the USA, over 100 local municipalities have implemented local laws recognising the inalienable rights of residents, natural communities and ecosystems and banning corporations from engaging in particular activities that violate these rights. Australia now has the opportunity to build on the rights that have been granted to the environment in other countries. We could begin by granting the Great Barrier Reef the foundational rights to exist, persist and flourish, as well as the right to restoration. Where we go from there is up to us. The Australian public can (and should) be creative in formulating rights to suit the specific challenges and unique situation of the Great Barrier Reef World Heritage Area. How would the Great Barrier Reef enforce its rights? Just as corporations are represented by Directors, EDO NQ suggests that the Reef could be represented by a board of trustees, legally required to act in the best interests of the Reef. A board of trustees for the Reef might, for example, be made up of members appointed by a variety of groups and organisations who have an interest in the ongoing wellbeing of the Reef. These may include one or more trustees nominated by the World Heritage Committee, Traditional Owners, the Queensland and Commonwealth Governments, as well as appointees from the tourism industry, and environment organisations. Although trustees might be nominated by a particular group, they would be under a legal obligation to put the interests of the Reef first. How would granting rights to the Great Barrier Reef change the management of the Reef? It is important to note that granting legal personality to the Great Barrier Reef would have little effect on the way the Reef is run day-to-day. The Great Barrier Reef Marine Park Authority (GBRMPA) would still oversee everyday activities on the reef, tourist operators would continue their business as usual and tourists would continue to enjoy the beauty of the Reef. The major difference is that the Reef would have representation for its interests in major decisions, ensuring that relevant Commonwealth and State agencies perform their environmental protection functions consistently and effectively. The trustees would also have power to enforce the Reef’s rights, on behalf of the Reef, if those rights were not respected. 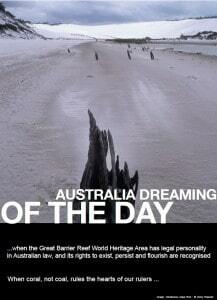 What can you do to support rights for the Great Barrier Reef? EDO NQ proposes that the best way to show Australia’s support for rights for the Great Barrier Reef is through a non-binding, nation-wide referendum (also called a plebiscite). To this end, we have started a petition, available at http://www.change.org (search for the phrase ‘legal personality’). A direct link to the petition is also available on our website (www.edonq.org.au). EDO NQ will soon be calling on people and organisations interested in protecting the Great Barrier Reef World Heritage Area to form a Working Party. Together the Working Party will begin the process of drafting a system of rights for the Reef. For more information on the processes and reasons for obtaining legal personality for the Reef, please see our website at http://www.edonq.org.au/Campaign.html. And remember, you can immediately help this process by signing the petition to hold a national vote on legal personality for the Reef and by donating to EDO NQ. Please visit www.edonq.org.au/Donate.html.